I was over at a friend’s place and they suspected that there was a mouse in their house. Later that evening their cat went running into the kitchen so we followed to investigate. Chris was hearing some sort of sound coming from the counter so he decided to move some bags and objects out of the way and set them on the island behind us. We were listening very carefully and slowly leaning in to where we thought the sound had originated from when suddenly there was a rustle behind us. The mouse popped straight up out of one of the bags that Chris had just moved. It seemed to hover in mid air for a moment as we all watched in astonishment before launching down onto the floor and under the safety of the dishwasher. Not even the cat had reflexes fast enough to respond. Today is the last day to enter the Biff doodle raffle! Only 25 cents per entry and you may win a pile of tiny Biff drawings. Click the “make a donation” button in the sidebar to add your name to the basket. my cat’s tend to hunt mice in the neiborhood, and sometimes birds. It’s awesome! My cats will kill any insect that comes within a 5 mile radius….We had a mouse once and the cats just sat in front of the cage staring at it all day long I just knew if the mouse ever got out it was done for. Man, it looks like som giant wererat decided to come up and punch the container open. I’ve never had a rat problem before that wasn’t solved by rat traps. They always hung out in the basement, and putting peanut butter on the traps was good enough. There was one time during my childhood when a squirrel got stuck in our furnace and it was screaming…My parents sent me down into the basement for this event, but I heard a whole lot of screaming when it came out(I was the one to notice it, after one of my dogs)…I don’t remember the rest of the details too well, but apparently it bounced around before it went outside through an open door. Ugh. One morning, I went to take out the trash, and I saw ants by something. I looked down, and it was half a field mouse carcass. Thankfully, it was gone by next morning. Don’t get me wrong, I think mice are adorable little things, I always coo at them when we go to PetsMart. I just don’t like seeing mouse hindquarters with intestines splayed on my driveway. Biff should buy a cat or a moose on rollerskates. So, Mighty Mouse lives at Biff’s? Who’d have thought? catch the mouse and use him for EVIL! and hey, I’m back, lol. glad to be back and looking forward to more biff. 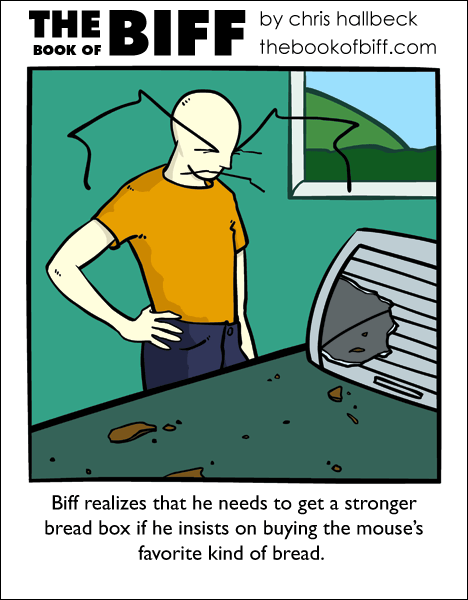 I think he really needs to buy a much stronger bread box mabye a soild steel one. That sould do the trick to keep a mouse out. We don’t really get mice here but I have encotred many other anaimls that like the mess with me Like moles and sankes. Raccons are evil they knock the trashcans over and scrach thing. I am guessing this week was Food week. Maybe he forgot to kill his bread like he did with his nachos. This reminds me of my first apartment; the building was like 80+ years old and had lots of places for mice to hide in. The first mouse I ever saw was in here… I was using the bathroom when it decided to make a mad dash from the pantry outside the door to it’s hole, which happened to be at the base of the toilet. I’m a 6’2″ martial artist and I still screamed like a grandmother when it ran between my legs to get to its hole. Biff, screw the rat traps and get a high-powered rifle or something for your mouse problem… it might be all that works on it at this point. my old cat called Bazil was extremely fat and slow. he didn’t catch many mice, as the mice were probably too fast. he usually went for slugs. (once he lept to catch a butterfly, missed, and hit a tree). hmm…rocket propelled cat would be a good idea. this is the best on in the past week or so. also, is Biff bald because of the mishap in comic #1? My cat, Nike, has a habit of eating bread and the packaging while the rest of us are asleep. One night a friend of my mom’s was staying over. Well I here her calling me and I go. “Oh great the kitten’s bothering her again.” I come in and see her standing up on the couch and looking over at the kitten. She says. “She has a mouse!” pointing to the kitten. So I took the mouse outside. Kitten spent awhile looking for it. What had happened is the kitten brought the mouse inside the living room from the kitchen. She asked the kitten. “Chloe what do you have there?” The kitten then LOOKED at her before droping the mouse which started to run around. Funniest night of my life. We had one one time, but I didn’t want to use a conventional mousetrap, or let our cat get it, because I wanted to let it live. My place was to catch it and release it a few blocks down the road. You know, find a new home in the wild (since we lived way out in the middle of nowhere). Anywhos, I made one of those cartoon style traps, basically, a shoebox with a pencil holding it up, attached to a strinch, and some peanut butter under it. The mouse would go for the peanut butter, I’d pull the string, and I’d catch it. It took me about four tries. Then, after that, it escaped another 3 times after I DID catch it. I checked to make sure it could NOT jump high enough to get out. It couldn’t even make it 2/3rds of the way, so I was satisfied. It was, however, about 2 AM when I did manage to get that far, so I decided to leave it ’til morning. Just before I went to bed, however, I saw it jump up on to the rim of the basket, look at me for a few seconds, and then jump down and run away. I never saw it again. Until my cat left its head right in front of the doorstep. I felt horrible, because I felt it was partially my fault. In the future, I’ll be sure to send the mouse to safety ASAP.